Anthony van Dyck Flemish painter, Rubens's pupil (born on March 22, 1599, in Antwerp - d. London on December 9, 1641). He was one of the most important and prolific portraitists of the 17th century. Influenced by painters like Titian, Paolo Veronese and Giovanni Bellini, he adopted colors of great richness. In 1632 van Dyck had become the Court Painter of Charles I, King of England. There he was knighted. Van Dyck's style of portrait painting influenced English portraiture throughout the 18th century. "Lord John and Lord Bernard Stuart"
"The Rest on the Flight to Egypt"
"The Virgin and Child with Donors"
Biography Web Gallery of Art. 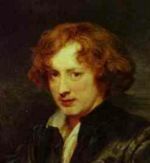 DYCK, Sir Anthony Van - Biography ARTCHIVE. This page was last modified on 18 January 2017, at 16:30. This page has been accessed 17,813 times.